Before hiring a commercial landscaping company, there are several considerations to take into account to make sure you work with the right partner. The biggest consideration is to create a comprehensive request for proposal (RFP) process. Taking the time to create an RFP ensures that all bidding companies follow the same guidelines, all your needs are met, and bidding companies meet all of your requirements. 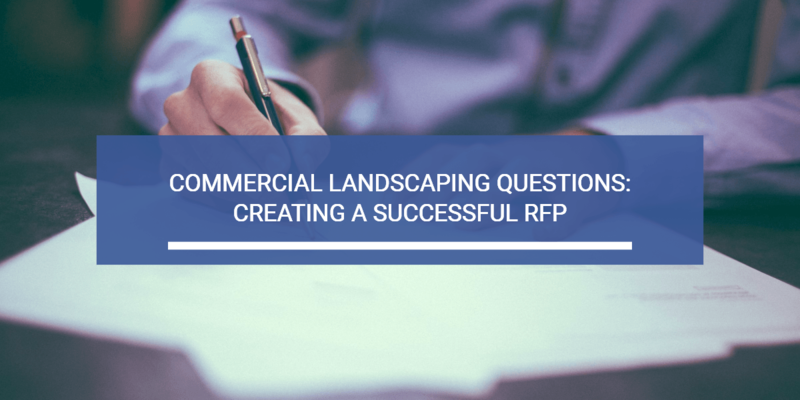 Before we discuss how you can create a successful commercial landscaping RFP, it is important you understand what this process is all about. With a correctly written RFP, property owners or HOA board members will be able to identify their landscaping requirements in detail. When reviewing different responses from bidders, RFP responses provide a standardized platform for a detailed comparison in terms of investment, function, and approach. There are important elements you need to cover in order to have a comprehensive commercial landscaping RFP. Guiding your potential bidders should be the first one. Let them know the specifics of the type of project they will be bidding on, for example, a landscape maintenance project rather than an excavation. This helps you get the most accurate responses from the right landscaping contractors. Setting your expectations and letting companies know what your property needs is also crucial. Remember it’s not all about mowing the lawn, cleaning up the leaves or fertilizing the property. There is more than just the basics. Be clear about your expectations and needs. If there are certain hours of the day or days of the week where noise is not welcome, say that in your RFP. When writing down your needs, it is important to note areas that need special attention. A property walkthrough is the only way you will be able to see exactly what needs to be addressed in the proposal. For instance, if the irrigation system is not working properly, you will want to specify that in your RFP. Another major point is insurance – the last thing you want is a company that’s not insured, working on your property. The liability then transfers to you. So the RFP should specifically state this. Remember the landscaping industry is as risky as any other industry that uses machinery. Poorly-trained or uninsured heavy-duty equipment operators can cause a nightmare for commercial property owners or homeowner associations. Each bidding company should have a list of references to supply, and this should be stipulated in the RFP. Call the references – they will give you more information about a company’s experience. It is always important that you dig for details before hiring anyone. Your RFP can help you do that. Finally, make sure you include a quotation request in your proposal – you need a tangible price. There are companies that are reluctant to give pricing. For stakeholders to be on the same page, it is always important to have the pricing beforehand. Remember the RFP is valuable to ensure quality and a safe working ground. This proposal will help you establish open communication. So requesting a price is a necessary step. After the bidding process, you will create a shortlist of companies you may want to work with. The next step is to interview these companies to get a more thorough understanding of how they will work with you. What installation process will be used? Now you have created a process where you can compare, apples-to-apples, bids from different landscaping companies. From that, you’ve selected some you want to interview further. Based on these interviews, you probably have a good idea of which company you want to hire. Now comes the time to finalize the details and sign the contract. Your landscape contractor will provide the contract, and you’ll want to review it with your board or attorney. Make sure the price and any additional expenses are clear, along with the term of the agreement. Following this process, you will work with a company you like, you trust, and will meet your expectations. It’s time to relax and enjoy your beautiful property.